Bachmann Durango and Silverton HO Scale Ready To Run Electric Train Set. Complete Set includes everything you need to build your own Railroad. Featuring Bachmanns Easy to Assemble EZ Track. HO Scale 1:87 -- Conforms with NMRA (National Model Railroad Association) Standards. DCC-ready 2-8-0 locomotive and tender with operating headlight. Factory-installed 8-pin socket ready for DCC decoder installation of your choice. Oval of snap-fit E-Z Track. Power pack and speed controller. HO Scale Ready To Run Electric Train Set. Built originally as a mining line, the scenic value of the Durango & Silverton was quickly recognized in passenger service. After surviving natural disasters, wars, and financial instability, a determined staff (and starring roles in several Hollywood movies) promoted the tourism that ensures the line's survival to this day. Now recognized as a National Historic Landmark and a National Historic Civil Engineering Landmark, the Durango & Silverton continues to provide year-round tourist service. Our Durango & Silverton passenger set comes complete with. Discover for Yourself All the Products Bachmann Industries Offers. Since 1833, Bachmann has been known for providing innovative design at a good value. We are now the world's largest distributor, by volume, of ready-to-run train sets, locomotives, track, and accessories. Bachmann is also one of the few train companies to offer products in all five of the most popular scales: N, HO, On30, O, and Large Scale. As the distributor of the beloved Thomas & Friends, Bachmann bring the adventures of Thomas the Tank Engine to life with a growing line of complete train sets, separate sale items, and accessories for children from 8 to 80just add your imagination. Thomas & Friends are now available in both HO and Large Scale. Bachmann's exclusive E-Z Track System makes track setup quick, easy, and fun. And SceneScapes buildings and accessories let you add the finishing touches for the perfect layout. After surviving natural disasters, wars, and financial instability, a determined staff (and starring roles in several Hollywood movies) promoted the tourism that ensures the line's survival to this day. Our Durango & Silverton passenger set comes complete with: DCC-ready 2-8-0 locomotive and tender with operating headlight open excursion car old-time combine old-time coach 47? Oval of snap-fit E-Z Track(c) including 12 pieces of curved track, 1 piece of straight track, and 1 curved plug-in terminal rerailer power pack and speed controller illustrated instruction manual WARNING: CHOKING HAZARD - SMALL PARTS! NOT INTENDED FOR CHILDREN UNDER 3. 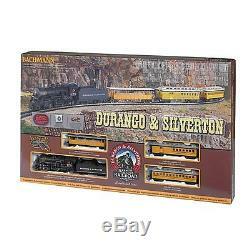 Durango and Silverton HO Scale Ready to Run Electric Train Set. Built originally as a mining line, the scenic value of the Durango and Silverton was quickly recognized in passenger service. Now recognized as a National Historic Landmark and a National Historic Civil Engineering Landmark, the Durango and Silverton continues to provide year-round tourist service. Our Durango and Silverton passenger set comes complete with:2-8-0 locomotive and tender with operating headlight, open excursion car, old-time combine car, old-time coach car, 47? Oval of snap-fit E-Z Track, power pack, and speed controller. Age Rated 14 and UpDurango and Silverton HO Scale Ready to Run Electric Train Set. Age Rated 14 and Up. 47 x 38 x 3 inches. Boxes, APO, or FPO addresses. Items must be undamaged and still in new condition. The item "Bachmann Durango and Silverton HO Scale Ready To Run Electric Train Set" is in sale since Monday, April 4, 2016. This item is in the category "Toys & Hobbies\Model Railroads & Trains\HO Scale\Starter Sets & Packs".xio" and is located in United States. This item can be shipped to United States.